The Conference began with the address of Minister of State for Agriculture & Farmers Welfare, Gajendra Shekhawat. Shekhawat said that “lack of cooperation of the state governments was posing a huge challenge in the implementation of the Pradhan Mantri Fasal Bima Yojana (PMFBY)” which was conceived by the present government to provide comprehensive agriculture insurance in the country. Continuing with his speech he added that agriculture being a state subject, the states would have to come on board to iron out the glitches in the implementation of the scheme. He advised FICCI to conduct brainstorming sessions on the subject in the states and come forward with recommendations on ways to bring the laggard states at par with good performers to derive the full potential benefits of the scheme. The feature of the knowledge papers were there key aspects and recommendations. According to the papers Accelerating Agriculture Insurance’, Indian agriculture is dependent on monsoon in such a way that any deviation in the onset or departure of monsoon largely affects agricultural productivity in the entire Indian subcontinent by leaving farmers in the lurch. The vagaries of monsoon still decide the fate of farmers across the country, especially in the drought-prone regions. It is estimated that over 50% of the total population of the country is engaged in agriculture and a majority of them are still dependent on monsoonal rain for irrigation. Indian Monsoon has a direct relationship with the global climate change, which is evidently showing impact across the country in forms like the early and the late arrival of monsoon, temporal fluctuation in the onset of seasons, unprecedented rainfall and associated phenomena. Huge variations in the climatic conditions make it challenging to tackle the menace of climate change especially related to key environmental parameters such as temperature and rainfall. There has been growing consensus among climatologists that global temperatures and precipitation patterns are changing. The last three decades have seen a gradual drop in the quantum of precipitation during the monsoon. The remarkable increase in temperatures and decrease in the amount of rainfall has already started hampering crop production in the country. In addition to this, the number of rainy days has also reduced with the rainfall averages remaining the same, thereby causing uncertainties. Another impact of climate change hampering the crop production is the increasing incidents of El Niño and La Niña, which have been having a direct impact on the monsoonal precipitation. 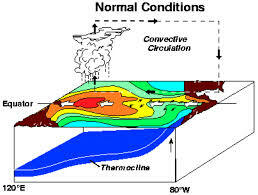 El Niño has been proven to have influenced global temperatures besides global warming. The worst part about both these phenomenon is that their earliest indication comes very late. In recent years, the erratic and unpredictable behaviour of monsoon, accentuated by climate change has caused extensive financial losses in terms of crop failures, damage to agricultural infrastructures, loss of lives and properties etc. due to natural and manmade disasters and destruction to environment and farmlands. This has aggravated food insecurity in the country. The paper states that in order to combat this challenge, there is need to adopt a strategy which may provide a comprehensive solution to farming communities for safeguarding agricultural productivity. Crop Insurance is one such area which is gaining momentum in the contemporary scenario. This is considered as the best option to transfer the cost of potential losses due to disaster or emergency situations. By adopting crop insurance, farmers can also leverage technology & data analysis to monitor, manage, and reduce the impact of those risks. The government has taken several initiatives for the overall sustainable development of farmers and cultivators to protect livelihoods and to enhance their agricultural productivity. These may enhance credit flow to farmers and expand the area of crop insurance and irrigation coverage specifically in the era of changing climate. Few aspects like shadow farmers and tangent farmers were also the point of discussion along with the effective use of various mechanised tools like drones and satellite’s interconnected network for real-time mapping of loss. The major attraction was humble acceptance of all the government representatives that there is still a large number of loopholes present in the system and there is a need of vision to overcome such anomalies. The conference was also addressed by CEO of National Rainfed Area Authority, DG of Indian Meteorological Department and United States Aid Program Representative of India. Representatives from renowned insurance agencies and Ministry of Earth Sciences were also present and shared technical insights of pros and cons in crop insurance segment.